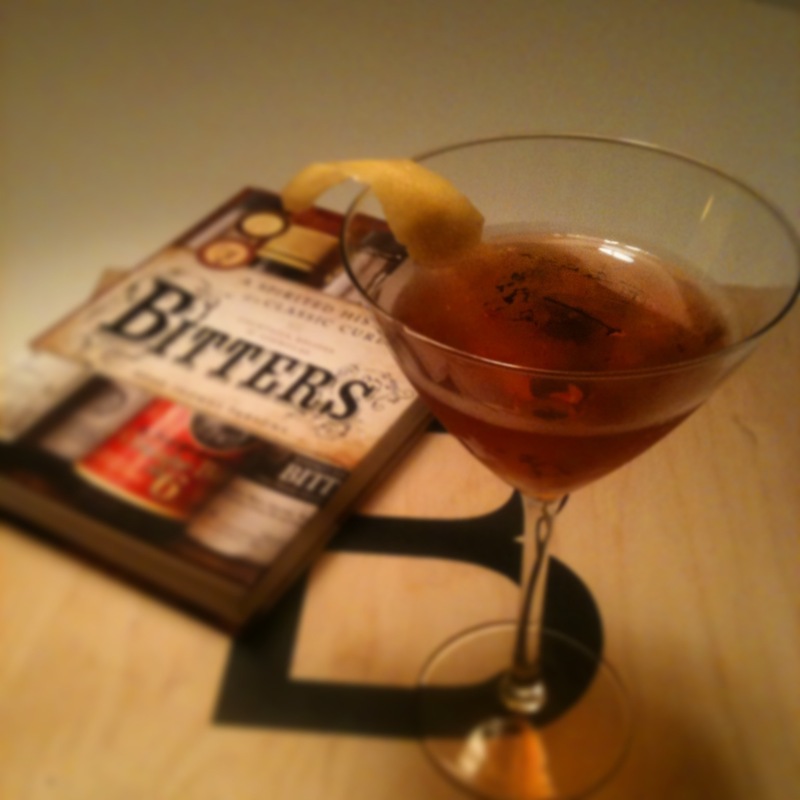 Rob Roy, made to Brad Thomas Parson’s recipe in his Bitters book. Cocktails made with scotch whisky are not that unusual, but the general opinion is that whisky is too flavourful a drink to mix well with others, and should be enjoyed by itself. That might be the case for many single malts, which have such a unique flavour profile that it is hard to see them sitting well with any other flavours in a glass (the exception being such modern drinks as the Penicillin, which features Laphroaig), but blends have been designed to have a consistent, if less characterful flavour. They then lend themselves to mixed drinks better than the unique single malts; part of this comes from the combination of more neutral grain spirits, mixed with some malt whiskies, to produce the blend’s own flavour. The Rob Roy can be seen as a Manhattan made with whisky, but the smokiness and slightly less sweet nature of scotch produces a quite different drink which stands in its own right. Like the Manhattan, a Rob Roy can be ordered dry (with only dry vermouth), perfect (a mixture of dry and sweet vermouths), though the standard drink is made with sweet only. The result is a rich, smoky cocktail, with a touch of herbal & wine-y flavours from the vermouth. One element that must not be overlooked is the presence of bitters. As per the Manhattan, the usual bottle to reach for would be the Angosturas, but I think that something with a more citrus flavour suits this drink better, and as I was mixing my version from the recipe in Parson’s Bitters book I followed his advice: I made my drink with Peychaud’s bitters, although Fee’s Orange would also be a good choice. Garnish follows the Manhattan route: cherry for the sweet version, lemon peel for the dry/perfect variants; I used a lemon peel in my straight Rob Roy: it seemed to me the lemon flavour cut through the sweetness slightly better. Stir in your mixing glass, over ice, until well chilled. Strain into the Martini glass, and garnish with either lemon peel or cherry, to your choice. History notes: There’s not much debate to the story behind this one: in 1894, the barman at the Waldorf Astoria Hotel was asked to create a cocktail to mark the opening of Rob Roy, an operetta written by Smith & De Koven; the barman mixed a Manhattan with scotch whisky, and named it for the hero of the piece. The operetta seems to be lost in past, but the cocktail recipe lives on.